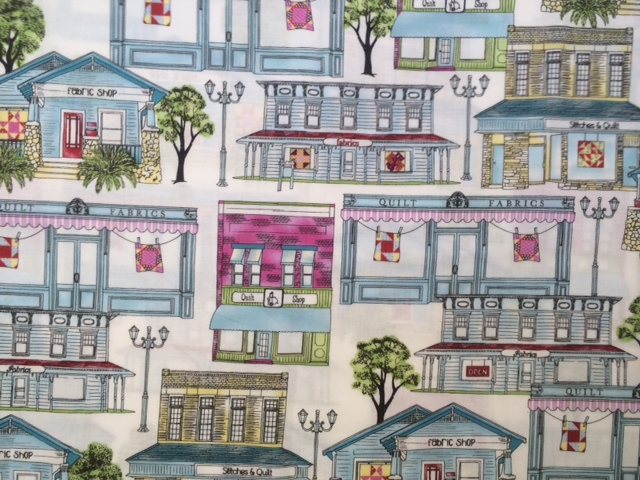 Recently arrived in a quilt shop near you is Shop Local, Windham Fabrics tribute to the stores in our communities that make our creative lives vibrant and fun! Have you spotted it at your LQS yet? We referenced four local quilt shops in the focal fabric seen above. Do you spot your LQS here? Leave us a comment and let us know! Windham Fabrics is teaming up with one of our favorite pattern designers, Erin Schlosser, of Schlosser Designs, to prepare a pattern and fabric give-away. 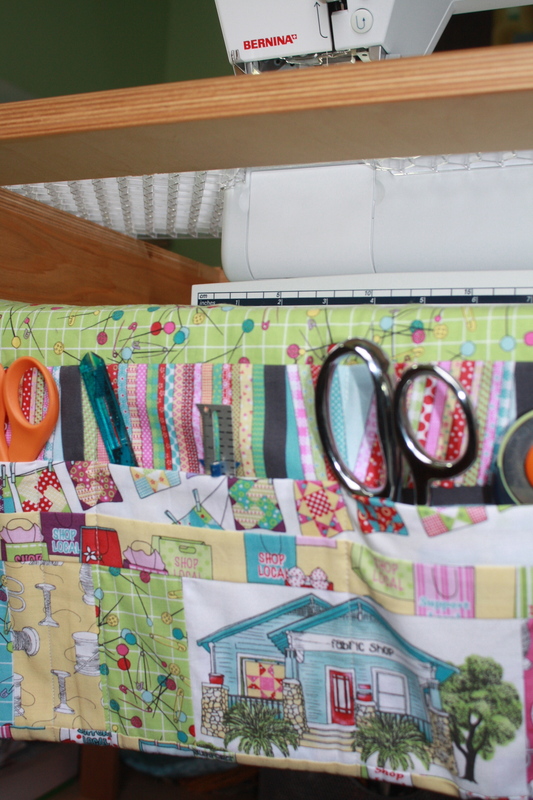 Erin has designed a fantastic sewing machine apron pattern to hold all of your supplies, right at your fingertips. And don't you think Shop Local is the PERFECT collection for it?! We hope so! We will be giving away 4 prizes: 3 FQ bundles of Shop Local and a top prize of Erin's pattern and the fabric needed to make it. Winners will be chosen on Monday, February 24th, at 10 a.m. Leave a comment to be entered. Grand prize: Sewing machine apron and fabric to make it. 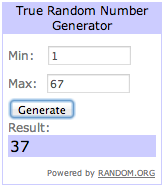 THE WINNER IS: Melissa Miller! Congratulations, Melissa!! 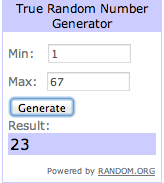 Runner-up prizes, FQ bundles: And the winners are— Jachelno, Alyssa Wright and Carmen! Alyssa Wright and Carmen, please email me nell@baumtextile.com to claim your prizes!! Thank you for the opportunity to win the beautiful fabric and pattern! Love your fabric line! Quilt blocks on the line is reminiscent of my local quilt shop’s once a month BlockBusters (it’s a quilt of the month ‘club’). You bring in your finished block from that month’s pattern and they hang it on the line to display. Can’t wait to find your fabric! The fabric is delightful and would make wonderful sewing room décor, or a great tote. And the design for the sewing caddy is positively inspired. We could all use one of those. Thanks so much for the chance to win! 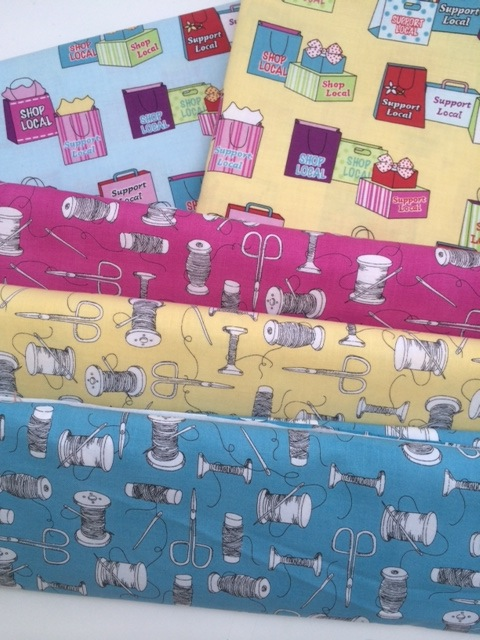 I love this collection- wonderful artwork, great colors- I would definitely spruce up my sewing area with these fabrics! Thanks for the chance to win! The fabrics are just fantastic! I’d love to make a sewing machine cover. Way too cute..I have a local shop that is supposed to carry it…I’m heading there soon! Super cute! And Erin’s patterns are super awesome! This fabric is beautiful, and the pattern is awesome! Thanks for the chance to win! Absolutely beautiful fabric, would love to win it and make the sewing machine apron. Thanks for the chance. Great project – the fabrics are perfect for it!! 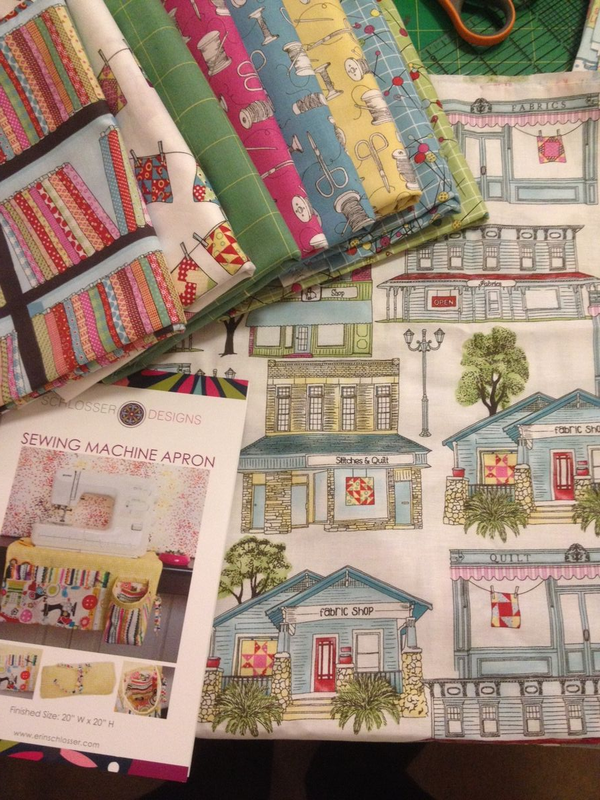 Yes I agree – Shop Local is perfect for that sewing machine apron. Can’t wait to make one. Thanks for the giveaway. Awesomeness! I love my local quilt shop. They have the most incredible fabric and a large selection that you don’t see in most quilt shops !! Of course you have to drive to upstate snowy New York to get there, but I plow through the snow at least once a week to see what new fabric has come in !!! !